2017 marks the 100th anniversary of Canada’s federal income tax. In commemoration of this milestone, a half-day symposium will be conducted in conjunction with the Spiegel Sohmer Colloquium on 2 October 2017. The goal of this symposium is to explore the evolution of tax law and policy in Canada over the past century. The symposium will feature a keynote by Kim Brooks followed by two roundtable discussions in which experts confer on some of the key themes of tax law and policy development in Canada. 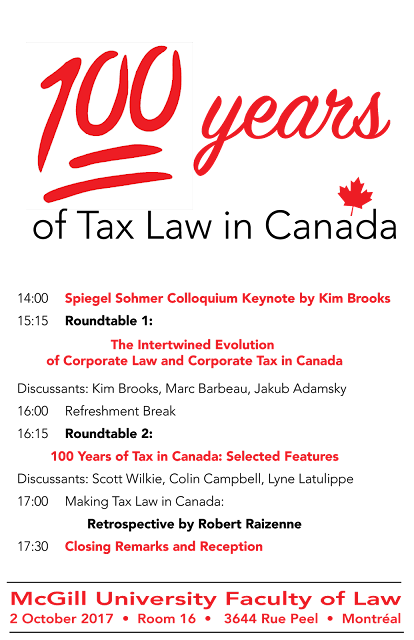 The symposium will conclude with a cocktail reception to celebrate 100 years of federal income tax in Canada. Kim Brooks, Professor of Law, Dalhousie University. Prof. Brooks is an internationally recognized tax scholar who has written multiple scholarly works on taxation in Canada and beyond. Jakub Adamski, lecturer in business associations and contract law at McGill Faculty of Law. He runs a seminar on the history and development of corporate law with Marc Barbeau, with whom he is co-authoring a text on the subject. Marc Barbeau, adjunct professor of corporate and securities law at McGill Faculty of Law and partner, Stikeman Elliott. Me. 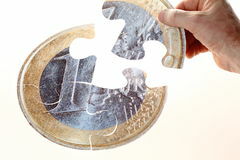 Barbeau practices in the areas of mergers and acquisitions, complex reorganizations and corporate governance. He runs a seminar on the history and development of corporate law with Jakub Adamski, with whom he is co-authoring a text on the subject. Scott Wilkie, partner, Blake’s, and Distinguished Professor of Practice at Osgoode Hall Law School, York University. Mr. Wilkie is recognized as a leading corporate tax lawyer in Canada and has extensive experience in national and international corporate tax practice. Colin Campbell, Associate Professor, University of Western Ontario. Prof. Campbell was a senior partner in the Toronto office of Davies Ward Phillips & Vineberg LLP until mid-2010 when he took up a position at UWO to teach and undertake research on Canadian tax history. Lyne Latulippe, Professeure agrégée, École de gestion, Université de Sherbrooke. Prof. Latulippe’s work on the institutional aspects of international taxation development and the conduct of professional tax advisors is widely recognized and influential. Robert Raizenne, adjunct professor of tax law at McGill Faculty of Law and partner, Osler, Hoskin & Harcourt LLP. Me. Raizenne has extensive experience in a wide variety of tax matters and is a sought-after speaker and writer on national and international tax topics. This is an important analysis because it is clear that the meaningful participation of non-OECD countries in the development of international tax norms going forward is both difficult and imperative in terms of both legitimacy and effectiveness of the evolving international tax order. 2017 marks the centennial of Canada's federal income tax, so it is appropriate that this year’s tax policy colloquium at McGill Law will focus on the theme of 100 Years of Tax Law in Canada. The colloquium is made possible by a grant from Spiegel Sohmer. The land on which we gather is the traditional territory of the Kanien’keha:ka (Mohawk), a place which has long served as a site of meeting and exchange amongst nations. Kim Brooks, Professor of Law, Dalhousie University. Former Dean, Dalhousie Law, Prof. Brooks is an internationally recognized tax scholar. On October 2, she will present a keynote and take part in a half-day symposium on the history of tax law in Canada. Amir Pichhadze, Lecturer, Deakin University, Australia. Prof. Pichhadze is an emerging scholar who studied comparative tax law in the U.S. and U.K. and completed a Judicial Clerkship at the Tax Court of Canada. On October 23, he will present work in progress on the development of value added taxes in Canada, the U.K., and the U.S.
Shirley Tillotson, Professor of History, Dalhousie University. Prof. Tillotson is a recognized expert in Canadian tax law history, and has written multiple articles and books on the subject. On November 6, Professor Tillotson will present on her new book entitled “Give and Take: The Citizen-Taxpayer and the Rise of Canadian Democracy,” and her upcoming research plans. Ajay Mehrotra, Executive Director and Research Professor, American Bar Foundation, and Professor of Law, Northwestern University. Professor Mehrotra is a leading voice on tax history in North America who has studied various aspects of interrelationships and influences in Canadian and U.S. tax law history. On November 20, he will present a work in progress on intersecting developments in Canadian and U.S. tax law history. Ashley Stacey, Associate, Olthuis, Kleer, Townshend. Ms. Stacey is a junior associate whose practice is focused on advising First Nations and First Nation-owned businesses on corporate and commercial transactions and who blogs at oktlaw.com on tax and governance issues relevant to First Nations communities. On December 4, Ms. Stacey will present her work in progress on historical and contemporary intersections of taxation, sovereignty, and autonomy of First Nations in Canada. The colloquium is open to all.